(Photo credit: Tom Casino/Showtime) At the world renowned Alamodome in San Antonio, Texas, WBC Super Bantamweight Champion Leo Santa Cruz (25-0-1, 15 KOs) of Mexico, successfully defended his title against Cesar Seda of Puerto Rico, by outpointing the game 122 pound fighter for twelve entertaining rounds. In the first round of action, both men landed hard leather to the body and head, attempting to prove their respective dominance. Although both fighters had their moments, Leo landed the harder more impactful shots in a very competitive opening stanza. The second period saw both fighters once again trying to establish domain within the squared circle. Whenever the defending champ closed the distance, Santa Cruz did the better work. But when Seda was able to keep the reigning title holder at a comfortable distance, the Puerto Rican fighter was able to land clean, effective shots form mid to long range. For the next several rounds, Seda did a very good job of catching Santa Cruz with sharp left hands as Santa Cruz attempted to close the distance. The Mexican born champion was unusually tentative at times, but still marched forward and landed hard combinations to the body and head whenever he was in range. In the fifth stanza, Leo Santa Cruz landed a hard right hand from mid-range that finally floored the game challenger in the closing seconds of the round. Seda seemed to be off balance and was up comfortably at the count of eight. Despite getting floored in the previous round, Seda implemented the gameplan once again and boxed intelligently, landing the left hand then quickly stepping to the side and out of harm’s way. Although Santa Cruz landed some very hard shots in close quarters, the defending champion had a difficult time closing the distance effectively. In the following two periods, Leo Santa Cruz was able to close the gap, landing hard hooks to the body and clean uppercuts to the jaw of Seda. While the tough Puerto Rican fighter did effective work from mid to short range, it was Santa Cruz who had the higher workrate and more consequential shots. In rounds nine and ten, the Santa Cruz express began to roll downhill and started pushing Seda around the ring. The reigning champ smelled blood in the water and began to have his way with his opponent, landing hard hooks to the body and head with occasional lead right hands to the jaw. In the final two rounds, Seda showed his heart and toughness and began to land crisp shots while stepping around Santa Cruz’s front foot. Although the championship rounds brought out the best in the brave Puerto Rican fighter, Leo’s size and ability to fight on the inside prevailed when it mattered most. 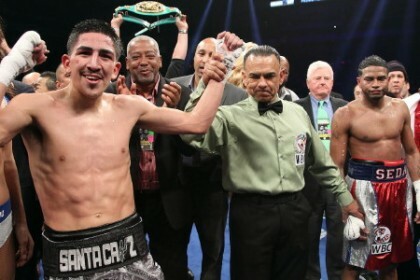 The judges at ringside scored the contest, 116-111, 115-112, and 117-110, all in favor of the defending WBC Super Bantamweight Champion, Leo Santa Cruz. After the contest, Leo Santa Cruz sounded apologetic when addressing the supportive San Antonio crowd. Seda saw the fight much differently. The unanimous decision victory marks Leo’s first title defense after winning the belt by stopping Victor Terrazas in August.